WSJ’s health columnist Melinda Beck tests out acupuncture as an alternative means to reduce her neck and back pain. While scientists say further research is essential, some studies have provided evidence of acupuncture’s effects. Arthritis of the Knee: Acupuncture significantly reduced pain and restored function, according to a 2004 government study. Headaches: Two 2009 reviews found that acupuncture cut both tension and migraine headaches. Lower Back Pain: Acupuncture eased it in a big study last year, but so did a sham treatment where needles didn’t penetrate the skin. Cancer: Has proven effective in reducing nausea and fatigue caused by chemotherapy. Infertility: Improves the odds of pregnancy for women undergoing in-vitro fertilization, according to a 2008 review of seven clinical trials. Addiction: Often used to help quit smoking, drinking, drug use and overeating, but there is no conclusive evidence that it works. After decades of cynicism, Western medical experts are using high-tech tools to unravel the ancient mysteries of how acupuncture works. WSJ’s Health columnist Melinda Beck joins Simon Constable on the News Hub to discuss. As fanciful as that seems, acupuncture does have real effects on the human body, which scientists are documenting using high-tech tools. Neuroimaging studies show that it seems to calm areas of the brain that register pain and activate those involved in rest and recuperation. Doppler ultrasound shows that acupuncture increases blood flow in treated areas. Thermal imaging shows that it can make inflammation subside. 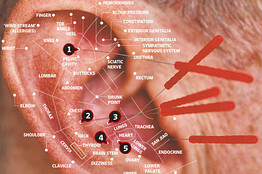 Even so, the use of acupuncture continues to spread—often alongside conventional medicine. U.S. Navy, Air Force and Army doctors are using acupuncture to treat musculoskeletal problems, pain and stress in stateside hospitals and combat zones in Iraq and Afghanistan. Delegations from Acupuncturists Without Borders are holding communal ear-needling sessions to reduce stress among earthquake victims in Haiti. Major medical centers—from M.D. Anderson in Houston to Memorial Sloan-Kettering in New York—use acupuncture to counteract the side effects of chemotherapy. In a 2007 survey, 3.2 million Americans had undergone acupuncture in the past year—up from 2.1 million in 2001, according to the government’s National Center for Complementary and Alternative Medicine. The most common uses are for chronic pain conditions like arthritis, lower back pain and headaches, as well as fatigue, anxiety and digestive problems, often when conventional medicine fails. At about $50 per session, it’s relatively inexpensive and covered by some insurers.It is also generally safe. About 10% of patients experience some bleeding at the needle sites, although in very rare cases, fatalities have occurred due to infections or injury to vital organs, mostly due to inexperienced practitioners. Most states require that acupuncturists be licensed, and the Food and Drug Administration requires that needles be new and sterile. Diagnoses are complicated. An acupuncturist will examine a patient’s tongue and take three different pulses on each wrist, as well as asking questions about digestion, sleep and other habits, before determining which meridians may be blocked and where to place the needles. The 14 meridians are thought to be based on the rivers of China, and the 365 points may represent the days of the year. “Invaders” such as wind, cold, heat, dampness, dryness factor into illness, so can five phases known as fire, earth, metal, water and wood. Studies in the early 1980s found that acupuncture works in part by stimulating the release of endorphins, the body’s natural feel-good chemicals, much like vigorous exercise does. Now, a growing body of research suggests that it may have several mechanisms of action. Those include stimulating blood flow and tissue repair at the needle sites and sending nerve signals to the brain that regulate the perception of pain and reboot the autonomic nervous system, which governs unconscious functions such as heart beat, respiration and digestion, according to Alejandro Elorriaga, director of the medical acupuncture program at McMaster University in Ontario, which teaches a contemporary version to physicians. Vitaly Napadow A specialized MRI scan shows the effects of acupuncture. The top two images show the brain of a healthy subject. In the middle two images, a patient with carpal tunnel syndrome registers pain (indicated by red and yellow). 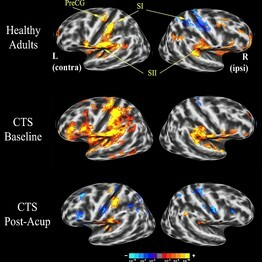 The bottom images show the calming effect (indicated by blue) in the brain after acupuncture. “You can think Western, you can think Eastern. As long as your needle goes to the nerve, you will get some effect,” Dr. Elorriaga says. What’s more, an odd phenomenon occurs when acupuncture needles are inserted into the body and rotated: Connective tissue wraps around them like spaghetti around a fork, according to ultrasound studies at the University of Vermont. Helene Langevin, research associate professor of neurology, says this action stretches cells in the connective tissue much like massage and yoga do, and may act like acupuncture meridians to send signals throughout the body. “That’s what we’re hoping to study next,” she says. Meanwhile, neuroimaging studies at the Martinos Center for Biomedical Imaging at Massachusetts General Hospital in Boston have shown that acupuncture affects a network of systems in the brain, including decreasing activity in the limbic system, the emotional part of the brain, and activating it in the parts of the brain that typically light up when the brain is at rest. Other studies at the Martinos Center have shown that patients with carpal tunnel syndrome, a painful compression of nerves in the wrist, have heightened activity in parts of the brain that regulate sensation and fear, but after acupuncture, their brain patterns more closely resemble those of healthy subjects. Brain scans of patients with fibromyalgia show that both acupuncture and sham acupuncture (using real needles on random points in the body) cause the release of endorphins. But real acupuncture also increased the number of receptors for pain-reducing neurotransmitters, bringing patients even more relief. The fact that many patients get some relief and register some brain changes from fake acupuncture has caused controversy in designing clinical trials. Some critics say that proves that what patients think of as benefit from acupuncture is mainly the placebo effect. Acupuncture proponents counter that placebos that too closely mimic the treatment experience may have a real benefit.